The Palestinians are in trouble. They know it; and so does the world. The latest – a Barghouti style hunger strike has been declared next week. The world is supposed to scream at Israel because it has driven the Palestinians to the desperate move of declaring a hunger strike. In recent weeks, Palestinians have set tires and fields afire, wielded knives and axes, set explosives on the border fence, tried dragging it down, pelted it (and soldiers) with rocks and boulders, fired hundreds of mortars and rockets at Israel civilians (including hitting a kindergarten less than an hour before it would have been filled with children). Nevertheless, they continue to claim that they are “peacefully” resisting an occupation that doesn’t exist. Over a decade ago, Israel unilaterally destroyed nearly two dozen thriving and beautiful communities so that Gazans could not claim any occupation. There are NO Jews in Gaza…except those being held by force and against international law. Apparently, the latest campaign involves a hunger strike. Hunger strikes have been used for many reasons, but rarely to justify a person’s right to kill others. In 1917, Alice Paul went on a hunger strike to demand that women be given the right to vote. A few years later, in 1924, Mahatma Ghandi went on a hunger strike, hoping to bring peace between warring tribes in India. And many years later, in 1982, Anatoly Sharansky, a Jewish refusenik began a hunger strike to protest the terms of his imprisonment in the Soviet Union. All that Sharansky wanted was to be allowed to emigrate from the Soviet Union to be reunited with his wife, began a hunger strike to protest the terms of his imprisonment in the Soviet Union. Against international law, he was denied his basic human rights. In 1989, hundreds of students in China went on a hunger strike to demand more representation in the government. These were acts of courage, by courageous people. By contrast, Marwan Barghouti is nothing more than a terrorist. A man responsible (tried and convicted) for murder. He has accused of 33 separate counts of murder. Because the chain of evidence was not strong enough, he weaseled out of all but five cases. Barghouti was convicted of murder in the case of five innocent people. An Israeli court sentenced him to consecutive sentences, rather than concurrent. Meaning, he’ll be in prison for FIVE life sentences. And, he has to serve each one before he can start the next. Also, to add insult because they recognized Barghouti for the thug he is, they added another 40 years for various attempted murders and more. In other words, he will die in prison. And the poor guy thinks that isn’t fair. All he did was kill some people, right? So he went on a hunger strike for better prison conditions (he wants time to sleep with his wife, more television, and maybe a doctorate). And, because he’s popular in a society that loves terrorists, he called on his supporters to join him. And they did. Join the hunger strike. The thing is…Barghouti didn’t. 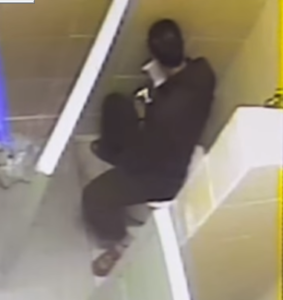 He slithered into the bathroom and was caught on video eating on several occasions. Needless to say, the hunger strike fizzled rather quickly at that point. So, now, apparently, the Palestinians have decided to again call for a hunger strike. Sort of like they called for peaceful protests and then proceeded to riot and attack anything they could reach. Now, the world might be getting upset, but there’s one major point here that should be mentioned. It’s Ramadan. Palestinians are already fasting something like 12-15 hours a day for religious reasons. So, are they planning on calling this a religious/political fast, or are they dividing it into segments. More importantly, how long do you think it’s going to take before the Palestinians realize this time that their leaders are laughing at their gullibility? Probably while hiding in bunkers and dining on four-course meals. It would probably be smart for them all to remember that, yeah, there are cameras in your cells and even in your bathrooms. So go on, be a Marwan and sneak eating…you really entertain the world with your sincerity…not..